The End of My Hiking Season? I live in a house with lots of stairs, and I try very carefully to avoid falling on them. I hold on to a handrail every time I go up or down, but last Friday I fell on an outdoor stairway that I had never worried about. There are five stairs going up from our front walk to the driveway; at the top of these stairs is a faucet. I was carrying two watering cans up these stairs to fill them at that faucet. I leaned forward from the stairs to put the cans in place when I lost my balance and fell. I landed on my right side, scraped my left arm against the wall, and felt an excruciating pain in my back and both legs. Pain seemed to last forever. I crawled to the front door, got to my study and phoned Don who was downstairs in his office. We had big plans for the weekend. On Saturday morning we were flying to Ashland , OR, for three nights, four days, to catch up on the two late season plays of the Oregon Shakespeare Festival and attend the Daedalus Festival, an annual event put on by OSF to raise awareness and money for HIV-AIDS. I was in pain, Friday night and Saturday morning, in my back and every time I put weight on my left leg, but I was determined not to miss Daedalus or Shakespeare’s Timon of Athens which I had never seen. So we set out Saturday morning. I tried using crutches or a walker (which we have around the house from previous injuries) and found that using one crutch on my left side somewhat relieved the pain. In the airports in Seattle and Medford I had a wheelchair. On Saturday evening and Sunday I got around to restaurants and theatres walking very slowly with one crutch. Once I was seated I was okay, but walking was an agony. On Sunday evening, Don noticed that I hurt only when I walked, but not when I was seated or walking sideways, like a crab. He found an agency in Medford that rented little scooters, and on Monday morning I was ecstatically mobile! Ashland is very hilly, but the city is very sensitive to walkers and wheelers. There are curb cuts at every intersection, and traffic stops to let pedestrians cross. I was not very good at backing up, but rolling forward was a dream. The house staffs in the theatres were terrific, showing me where to park the scooter and pointing out hidden restrooms that are available to the handicapped. When I left the scooter, I used my crutch and walked sideways to get to my seat. So what was wrong with me? At first, judging by the location of the pain and where I was exquisitely tender, Don thought I had injured my hamstring muscle. 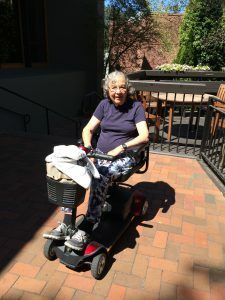 After a lot of poking and prodding, pulling on my leg and consulting with Dr. Judy in San Francisco, the consensus was that I had spinal stenosis. (I knew I had stenosis from MRIs taken when a disk blew out on the right side in 2008, but I had never had any pain on the left.) I tried to talk to my doctors in Seattle but it was very difficult to communicate, with plays to see, with staff leaving messages at home instead of cell phone, with offices that close down at five. Finally home late Tuesday night, I called my internist first thing Wednesday morning and was able to see him that afternoon. By that time, all the pain was in my left leg, and we were stunned to see that the back of my left thigh, down to the back of the knee, was an ugly purple color. A CT scan confirmed that it was not stenosis but I had torn my hamstring muscle. Then began a search for an orthopedist. Many of them do not treat torn hamstrings. A few phone calls later, I have an appointment for next week. More to follow. This entry was posted in Health, Hiking, Public Transportation, Shakespeare, theatre, Travel, Uncategorized and tagged Oregon, Oregon Shakespeare Festivalival, scooters. Bookmark the permalink. 3 Responses to The End of My Hiking Season? I think that you are far more intrepid than I ever would have been. This will be a long time healing it seems. Sending lots of good vibes your way for a complete recovery. Hope you were able to enjoy Ashland. I love the festival!! I am so sorry, Goldie. Our best to you, and I hope you can be back on the trail before TOO long. Take care.